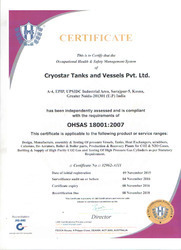 Established in 1988, M/s Cryostar Tank & Vessel Pvt Ltd. is an engineering company engaged in the design, manufacturing and exporting of Plants and Equipment For Industrial Gases. 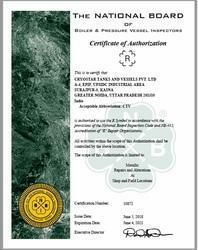 The company is headed by a very competent techno-commercial team under whose guidance Cryostar has steadily penetrated the export market and is making its presence felt all over the world in the field of industrial gas plants. 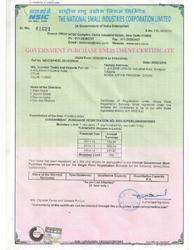 We are exporting our product globally. To take its business forwarded in the field of value added engineering, Cryostar has set up a very modern facility for the manufacturing of Pressure Vessels, Heat Exchanger, Columns, Structures, Boilers, Filter Vessels, Wind Power Equipment at Greater Noida (U.P. ), India. 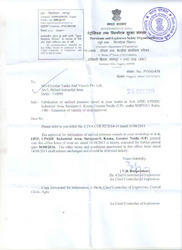 The fabrication shop has been approved by the Chief Controller of Explosives, Nagpur. 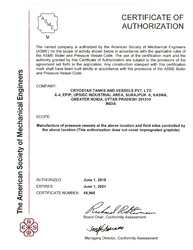 The company has also started the process of obtaining 'U' stamp certification from ASME engaging M/s. Llyod's Register Asia, U.K as the consultant. Carbon-dioxide plants are available in sizes between 50kg/hr to 4000 kgs/hr based on burning of solid, liquid or gaseous fuels or on recovery from breweries, distilleries, fertilizers, chemical processes and boiler flue gases. We supply storage tanks, transportation tankers, manifolds and allied equipment. Our wealth from waste plants can produce and recover CO2 from Biomass burning and flue gas recovery. At our organization, quality is a considerable issue on which we are focused enough. On regular basis checkups are conducted so that product quality can meet international standards. Also, best of the testing procedures are followed in order to render the products with utmost safety. We are a leading manufacturer and exporter of high quality range of carbon dioxide, nitrous oxide gas plants and allied accessories in India as well as associates with America, Germany and other countries. Also, the plants made in India make use of standard raw materials and components. Due to world class quality, our products are exported to several countries across the world such as Africa, Middle East, South America, and Asia & Europe. The vision of the company is to offer quality products for the engineering industries with all honesty, integrity and commitment to excellence. We have very experienced technocrats who are versatile, efficient and dedicated to the company.